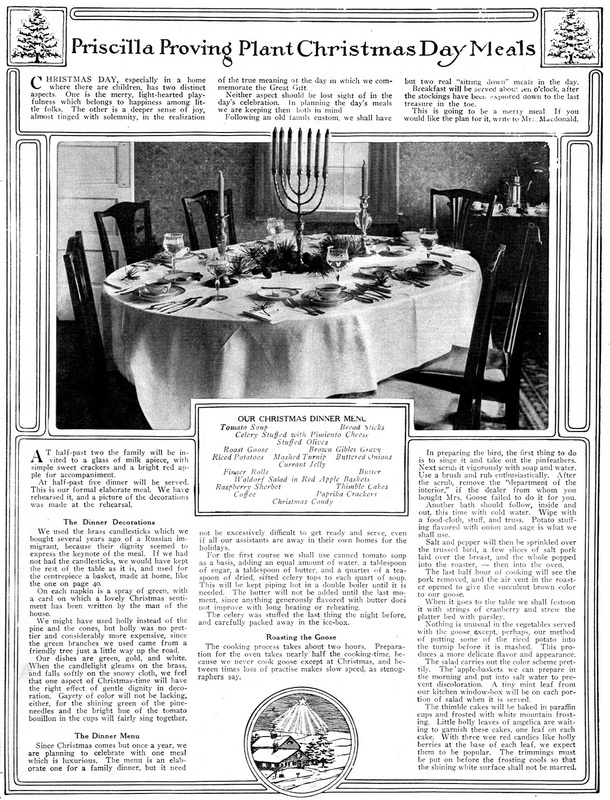 >Interesting that a Menorah is centerpiece on the Christmas table ;) The writer claims ignorance–"Brass candlesticks bought off a Russian immigrant".Funny too how fancy holiday menus still exist in magazines, but I don't know anyone who cooks that much food! Usually some form of pot luck is involved. >I don't care for waldorf salad, but I like the idea of "red apple baskets". Hmm, maybe I'll find another delicacy to serve in red apple baskets.I cook for holidays, it's such fun (to me) to put together a big, pretty feast- though the eating always seems anti-climatic. Mom always sets the most beautiful table on holidays, I suppose we're dreadfully old-fashioned. >I can't imagine planning my Christmas day so thoroughly that I schedule "a glass of milk apiece" at half past two. Even Martha Stewart isn't that much of a control freak! >I've never had goose, I wonder what it's like, similar to turkey or duck perhaps? I wish there was a picture of the red apple baskets, they sound so sweet.